Cream cheese danishes are a delicious creation. A lot of the time cream cheese danishes come pre-packaged at the store, and they are loaded in calories. I mean over 400 calories for a pastry? That’s way too much for me. These cream cheese danishes are under 300 calories each, and they are not teeth-hurting sweet. I have to say, these were delicious. They are fluffy, hearty, creamy, and sweet. I absolutely loved these danishes, and they were so easy to make. It seems like there are a lot of steps, so I took pictures along the way to show how easy it is to make these. This recipe will be in rotation for sure. The first real step to this recipe is to beat the cream cheese, Splenda, and vanilla extract until completely smooth. I used a hand mixer for this, but you can use a stand mixer if you prefer. The mixture should resemble a cheesecake filling after you beat it together. After you cream the cream cheese, separate the crescent rolls into 8 rectangles. I placed my crescent rolls on parchment paper for this so they would not stick to the counter. 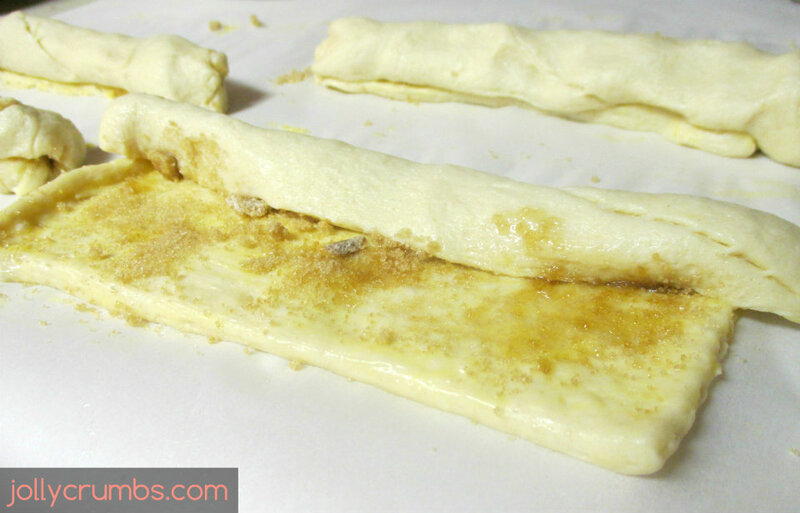 Seal the perforations on the crescent rolls so the rectangle is one piece of dough. So, both triangles of dough should come together to form a rectangle that you can seal together into one piece. Spread the melted margarine over each rectangle. You don’t have to use all of the melted margarine if you have extra. Sprinkle 1 tablespoon of brown sugar over the melted margarine on each rectangle. Again, don’t use all the brown sugar if you don’t want to. Next, roll the long edge of the rectangle towards you, so you will end up with a log-shaped rolled up rectangle. Do this on each rectangle. Place the logs onto the prepared baking sheet. If you notice the perforations coming apart again just pinch them back together. With the log-shaped dough, create a spiral shape with each log by holding one end and wrapping the rest of the dough around it. Pinch the ends of the spiral so they are sealed shut. Create a dent in the center of each spiral by pressing and pulling the dough in the center of each spiral. This will be for the filling, so you want a nice deep and even dent in the center for the filling. You may have to press down some of the dough so you have a nice well to put the filling in to. 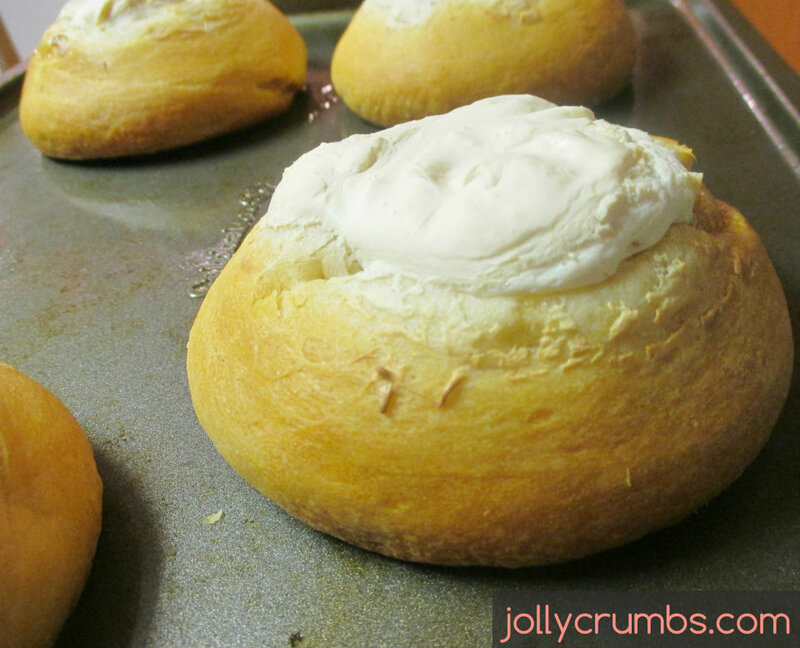 Place about 2 tablespoons of the cream cheese filling in the well in each danish. It may look like it will overflow, but the cream cheese bakes into the dough and firms up, so it will not bubble over. This is where the deep indent in the previous step comes in to play. I used two tablespoons of filling in each danish and it worked perfectly for the amount of filling the recipe makes. Bake for 15 to 18 minutes, or until golden brown. Whisk together the glaze ingredients, and drizzle the glaze over the warm danishes. If you love those cream cheese danishes you buy in boxes or plastic wrappers, you will love these. These will be your new best friend. Not only are these better for you, these taste better. They taste fresh and rich. I love everything about these danishes. 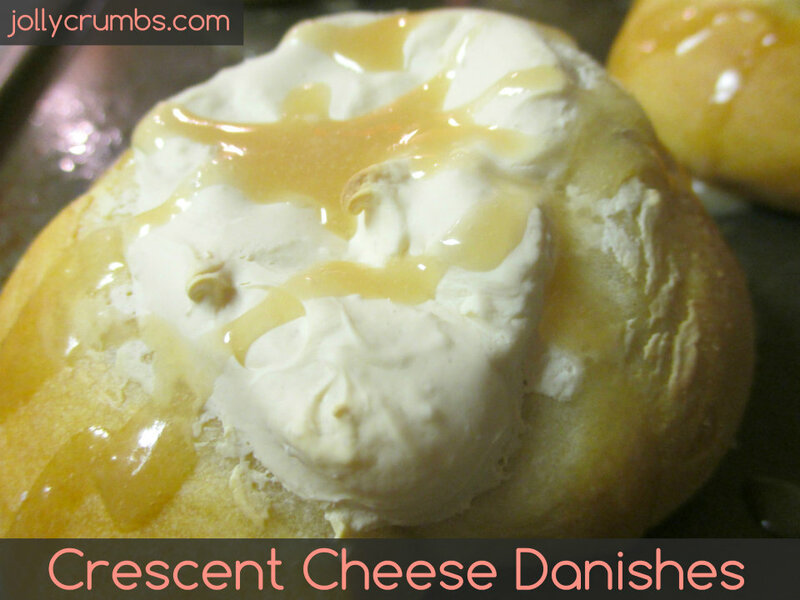 The cream cheese is bursting from the danish, which only adds to the deliciousness of this pastry. Samuel and I both had one for breakfast the next day, and it was just as delicious. I highly encourage you to try this recipe if you are a fellow danish lover. You won’t be disappointed! In a medium bowl, beat together the cream cheese, Splenda, and vanilla with a hand or stand mixer. Beat until it is completely smooth and resembles cheesecake filling. Separate the crescent rolls into 8 rectangles, so two crescent rolls each to form a rectangle. 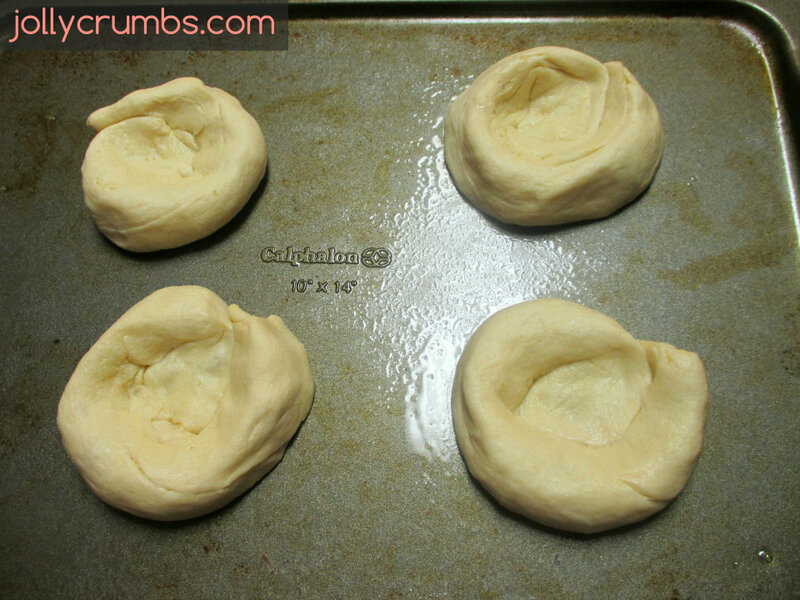 Seal the perforations on the crescent rolls so the rectangle is one piece of dough. Spread the melted margarine over each rectangle. 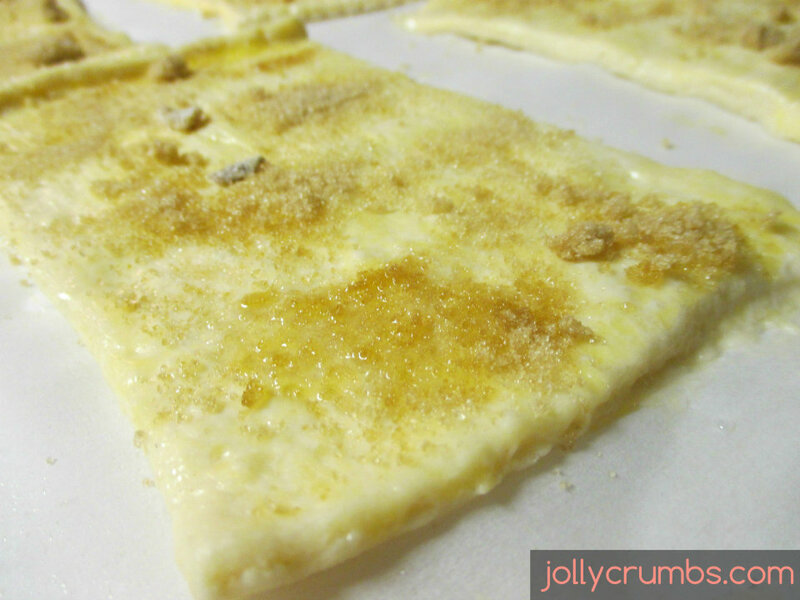 Sprinkle 1 tbsp of brown sugar on each buttered rectangle. Roll the long edge of the rectangle towards you, so you will end up with a log-shaped rolled up rectangle. Do this on each rectangle. Place the logs onto the prepared baking sheet. 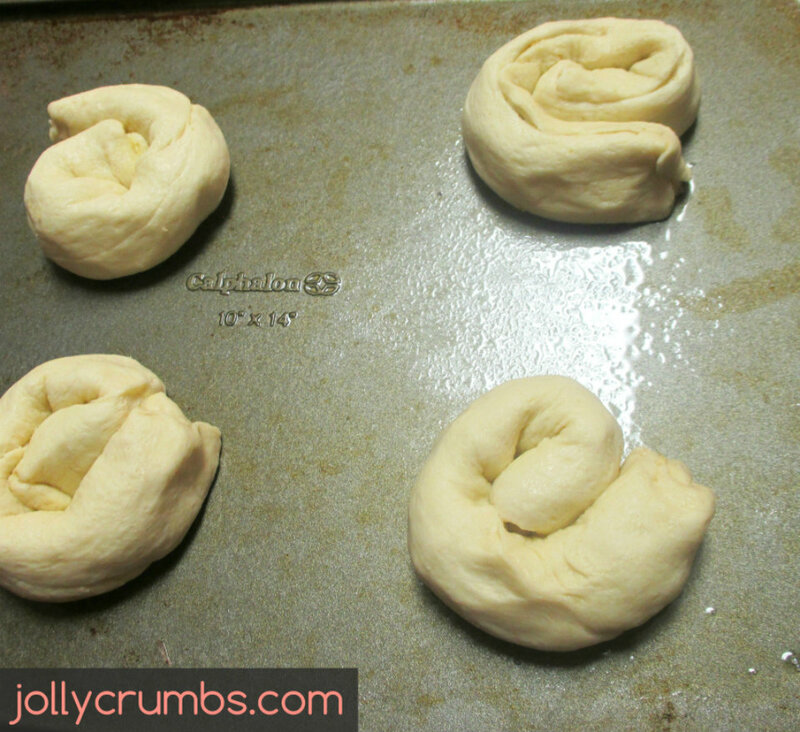 Create a spiral shape with each log of dough by holding one end and wrapping the rest of the dough around it. Create a dent in the center of each spiral by pressing and pulling the dough in the center of each spiral. This will be for the filling, so you want a nice deep and even dent in the center for the filling. Place about 2 tablespoons of the cream cheese filling in the well in each danish. Bake for 15 to 18 minutes, or until golden brown. 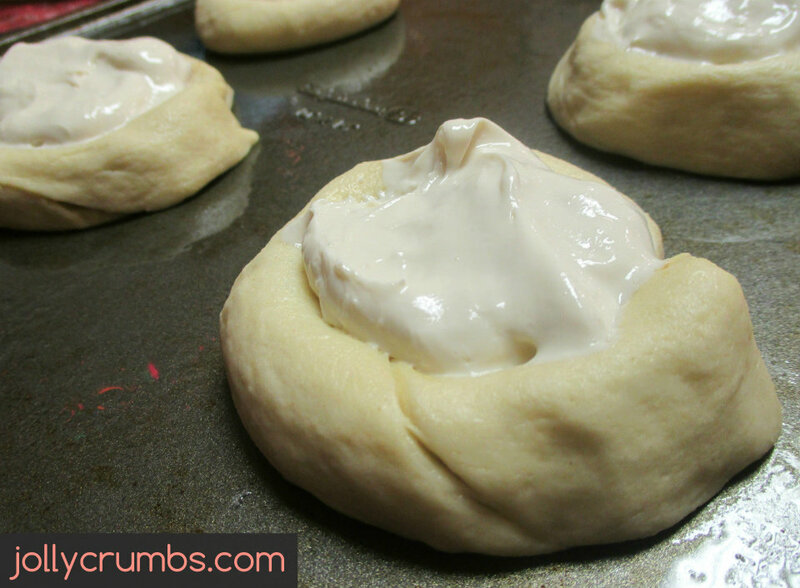 Top warm danishes with glaze. Whisk together the powdered sugar, vanilla, and milk until smooth. Drizzle over the warm danishes. I made some of these danishes for our anniversary breakfast. They were fun and easy to make and tasted so delicious!